With the beginning of the electoral campaign, Laurentino Cortizo, flag bearer of the PRD and Molirena, remains at the head of the intention to vote, breaking the fifty percentage point barrier in the preference of the people consulted; while Marco Ameglio, an independent candidate, was placed in the basement of the seven candidates, according to the latest opinion study conducted between March 7 and 9 by Stratmark Consultores, SA for La Estrella de Panamá y Protesa. This taking into consideration that the surveys are opinion surveys subject to not reflect the certainty of their results. 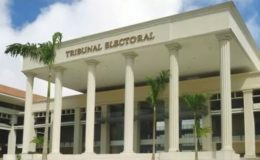 According to the study, which was applied to a sample of 1,034 from a universe of 2.7 million, Cortizo registered an increase of 3.6% in the intention to vote compared to the previous one, applied in February.The PRD candidate is the only one who registered a difference that exceeds the margin of error, which is + 0-0.3%. In the previous study, Cortizo remained at 48.7%. 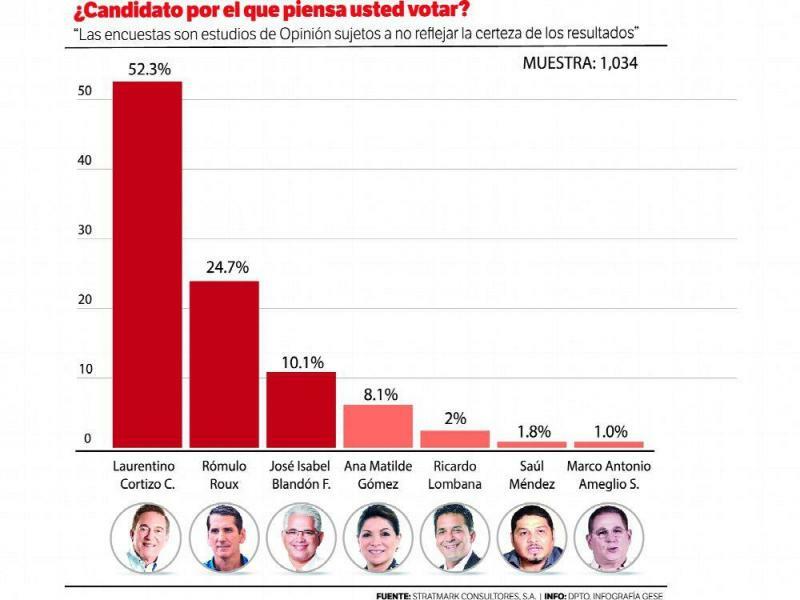 In this month’s study, Rómulo Roux, candidate of CD and Alianza, remains in the second place of the intention of votes, with a 24.7% support of the people consulted, which represents a slight increase of 0.8% with respect to to the results obtained in the past month of February, when it was located in 23.9% of the intention of vote of the people consulted by the company that carried out the field study. 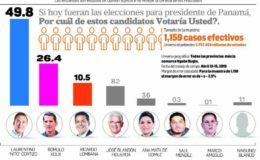 He is followed by José Blandón Figueroa, of the Panameñista Party, who dropped 0.7%; then there is Ana Matilde Gómez, who rose 2.0%; subsequently, Ricardo Lombana accumulated 1.2% in his favor; Saúl Méndez, who dropped 0.6%, and in the last box would be Marco Ameglio, who rose 0.2% (see graph). In the same opinion study, each of the people consulted was asked to mark the candidate for which they would “never” vote. 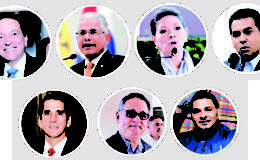 José Blandón Figueroa and Saúl Méndez take the first place in this negative response. The panameñista registers a 28%, whereas the candidate of the FAD is in second place, but very near, with a 27%. As a curious fact, Ricardo Lombana and Marco Ameglio are the candidates with the least negative index.The first registers 3% and the second 5%. Gómez has 8%, Roux 13% and Cortizo, 12% of those consulted. Based on the requirements of the Electoral Code for the disclosure of the results of this type of opinion studies, Stratmark Consultores, one of the three companies authorized by the Court to do so, reports that the universe composed of 2.7 million voters was taken a scientific sample of 1,034 people, who were consulted in a personal home interview with simulated ballot box votes, from a stratified random sample, where apples were drawn in urban centers. Urban centers were covered in all provinces. As a geographical universe for the application of the opinion study, all the provinces were taken into account, plus the Ngäbe-Buglé, Emberá and Guna Yala counties, based on the demographic data registered by the Comptroller General of the Republic. The study was conducted between March 7 and 9, at the end the results have a margin of error of + 0-0.3%.